The search for the right food for your dog can be exhausting. With so many choices and factors that go into your dog’s health, it’s tough to make a decision. We did the research to help simplify that decision and find the best dog food made in the USA. Several of the large manufacturers cut corners and source their mysterious ingredients from China and other locations. We set out to find the companies that are producing the highest quality dog food with local U.S. ingredients that are going to keep your dog feeling great for years to come. Below are our top recommendations, additional details on each recipe, and the factors we considered in our research. Overall, we found just a few brands that are making high quality dog food that is truly sourced and cooked in the USA. This research process was tough. There are a ton of dog food makers out there that cook in the U.S., but don’t source their ingredients locally. It took some digging in ingredients lists, testing, and extensive research to really get down to the brands that are doing the best job. We broke down our findings into what type and size dog each recipe is for, along with some other highlights that we felt like made their product shine extra bright. Here are some additional details on our top picks, along with what we liked, didn’t like, and links to where you can view the broader product lines for each of these great manufacturers. 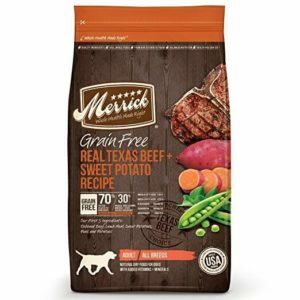 We were really impressed with Merrick’s sourcing and cooking process for all of their grain free dog foods. This Texas beef and sweet potato recipe is one of their best in our opinion and one of their most popular. The #1 ingredient? Real, de-boned beef. The next four ingredients are lamb, sweet potatoes, peas, and potatoes. Most of their ingredients are sourced locally from farmers in the Texas area where they operate, and they get absolutely zero ingredients from China. In addition to being grain free, all of their recipes have zero poultry by-products, artificial preservatives, corn, wheat, soy, or gluten. We also really like that they include Omega 3 and Omega 6 fatty acids, which are great for helping your keep a healthy skin and coat. 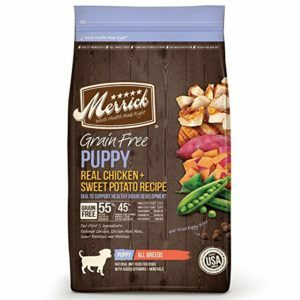 The dry puppy food from Merrick has a lot of the same qualities as we talked about above for their adult line – locally sourced ingredients, real de-boned meat, and no grains or other bad fillers. The puppy product line has some great added benefits that their customers love over the competition, like added DHA for brain development. It also has other vitamins and minerals to help with physical development. The chicken and sweet potato recipe is absolutely loved by most of the puppies who try it – it’s one of their highest rated recipes. In our opinion, Natural Ultramix is the best option out there if you want to stick with a grain free and poultry free recipe. The #1 ingredient is salmon, followed by real fruits and vegetables (like peas, bananas, and carrots) that you can actually see in the bag! Along with these wholesome ingredients, Natural Ultramix is packed with Omega 3 and 6 fatty acids (healthy skin and coat), calcium and phosphorus (healthy bones and teeth), and prebiotics to help support digestion. This recipe contains zero soy, corn, or wheat as well. Natural Ultramix is a good fit for pretty much any dog size or breed, and is typically for dogs in their adult stage of life. 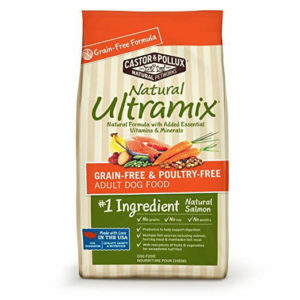 Natural Ultramix is just one of the product lines for Castor & Pollux, who also make great recipes under their PRISTINE and ORGANIX product lines. This Bil-Jac recipe is formulated with small dogs in mind, and the best small breed recipe we found among the competition. It has small, easy to chew bites and the three primary ingredients are chicken, oatmeal, and yams. This recipe is great for small senior dogs as well – if you mix with a little bit of water or wet food, this food softens up easily and is chewable by pretty much any dog, even ones with arthritis or bad teeth. 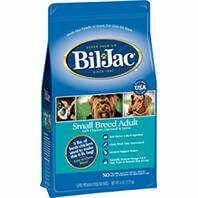 Bil-Jac Small Breed Select also has naturally sourced Omega 3 and 6 fatty acids to help your dog maintain a strong coat, and other vitamins to support their immune system. 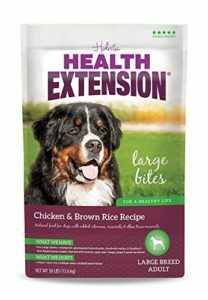 Holistic Health Extension does a great job making sure that their recipes have the vitamins that your dog needs to stay healthy, especially when it comes to large breeds who have an increased risk of joint problems. All of their recipes meet the requirements of the AAFCO Dog Food Nutritional Program, which basically means that their food is okay for dogs at all stages of life. This chicken and rice recipe of theirs is one of the best (and most popular) – dogs love it! The first ingredient is real, de-boned chicken. It contains absolutely zero by-products, rendered animal fats, corn, gluten, soy, artificial preservatives, wheat, added sugar, or other artificial flavors. Holistic Health Extension also makes dry and wet dog food for all other sizes and stages of life, and has an extensive line of vitamins and supplements for your pet. If you’re all about organic, Tender & True is for you. These guys start all of their recipes out with USDA certified organic chicken (the #1 ingredient), just like you would get from your local butcher. 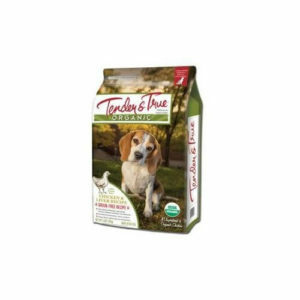 Their chicken and liver recipe is grain free, has other vitamins and minerals, contains zero artificial preservatives, and has no added hormones either. All of their chicken has been certified humanely raised by the Global Animal Partnership. Outside of chicken and liver, this recipe also contains peas, chickpeas, and potatoes, all of which their customers’ dogs seem to love. Why Does it Matter Where Your Dog Food is Made? Simply put, there are more regulations in the U.S. than abroad when it comes to pet food production. This allows overseas manufacturers to cut corners with more heavily processed ingredients and other low quality ingredients like propylene glycol, which is commonly found in antifreeze. Meat quality is super important and some larger dog food manufacturers cut the corners here. For starters, you want your first ingredient to be de-boned meat of some kind. We also eliminated several brands from consideration that had unnamed meats or meals in their ingredients list. A meal is essentially just concentrated meat. However, manufacturers aren’t required to tell you the specific breakdown of the meal itself. Therefore, we flagged any foods with a generic “meat meal” description that typically is a tip-off that they used something unnatural as a filler. There are a lot of ingredients out there that are not safe for dogs. Many people know about stuff like chocolate, avocado, and grapes, but ingredients like onions and garlic are also harmful for dogs. Here are some of the things we looked for and avoided in our evaluation. You don’t want to be living in fear over some potentially harmful ingredients in your dog’s food bowl. We eliminated several brands that had a history of several product recalls. Of course, we want to make sure that you are getting the best dog food for your money. There are several dog food manufacturers out there who throw fancy marketing terms at you to try and buy their products. We got rid of a few manufacturers from our consideration where we felt like the quality of the food did not match the price.